Though only five feet six and a half inches tall, this actor created one of television's biggest characters: as the ultra-cool greaser Arthur "Fonzie" Fonzarelli on "Happy Days" (1974-84) he became a pop idol overnight. A graduate of Yale with a Masters' in Drama, he appeared in dozens of commercials before making his screen debut, prophetically enough in the youth gang picture The Lord's of Flatbush (1974). He had a bit part in Crazy Joe (also 1974) before landing the role of "The Fonz." His subsequent attempt to translate TV fame to film stardom with leading roles in Heroes (1977), The One and Only (1978), and Night Shift (1982, directed by his "Happy Days" costar Ron Howard) were only modestly successful. He also hosted and executive produced EB>. and Where Did They Get 19 Kids? which won an Academy Award as Best Documentary of 1978. As "Happy Days" wound down, Winkler started directing his energies behind the camera. He coproduced the popular TV series "MacGyver" (1985-92) and the less successful "Mr. Sunshine" (1986), and directed the theatrical features Memories of Me (1988) and Cop and a Half (1993). 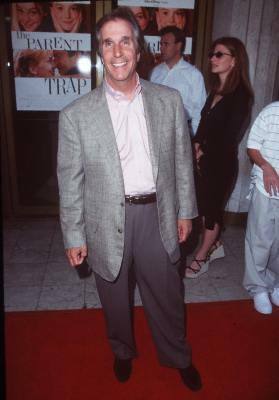 He returned to acting in the TV movies Absolute Strangers (1991) and The Only Way Out (1993), and took the starring role in the sitcom "Monty" (1994) playing a right-wing talk show host.